This past week was the first for out-of-town meets with one in Tucson and another at Southlake. There were also two major meets in El Paso – the UTEP Springtime Meet and the 13th annual Fred Loya Invitational at Eastwood High School. Cathedral senior Brandon Seagreaves improved on his city-best 3,200-meter time, improving on his own time by four seconds, turning in a 9:32.02 at Eastwood. San Elizario sophomore Edwin Gomez finished second in 9:33.04 to break a school record he set last year (9:38.54) at the UIL Class 4A State Championship. Also turning in city-best marks were Americas 200-meter sprinter Abel Cervantes (22.04) and Parkland’s Infante Jones who improved on his own 110-meter hurdler time (14.82). Here are the results from the UTEP Invitational – www.runnercard.com/runner/data/172096/1002358/result/high%20school%20results%20final.pdf. Cotton Relays Boys/Girls: 9 a.m. Friday, March 22 at Fabens. Parkland, Del Valle, Ysleta, Fabens, Tornillo, Anthony, Faith. Fox Country Boys and Girls Track Invitational: 9 a.m. Friday, March 22 at Jefferson’s Silver Fox Stadium. YWLA, Hanks, Bel Air, Jefferson, Coronado, Andress, Austin, El Paso, Montwood, Irvin. Chandler Invitational: March 22-23 in Phoenix. Eastwood, Americas, El Dorado, Burges, El Paso (B). Discus: 1, Johnny Cerros, Franklin 158 feet; 2, Misael Oriz, Socorro, 157-4; 3, Andrews Bristol, Franklin, 154-4; 4, David Moreno, Jefferson 152-10; 5, Zachary Cyrus Pomele, Pebble Hills, 150-4; 6, David Moreno, Coronado, 146-1; 7, Adam Vick, Franklin, 139-7; 8, Tony Holguin, San Elizario, 139-4; 8, Dominque Valera, Coronado, 139-4; 10, Jalen Henderson, Americas, 139-0. Shot put: 1, Misael Ortiz, Socorro, 53-1.5; 2, Garrett Strokes, Burges, 52-8.5; 3, Jonathan Lopez, Montwood, 49-9; 4, David Moreno, Jefferson, 48-9.5; 5, Arturo Jimenez, Horizon, 48-4; 5, Johnny Cerros, Franklin 48-4; 7, Andrew Bristol, Franklin, 48-00.50; 8, Nick Kim, Americas, 46-11.5; 9, Lean Smith Jr., Franklin, 46-8; 10, Dominique Varela, Coronado, 46-6. High jump: 1, Caleb Gerber, Pebble Hills, 6-8; 2, Christian Matamoros, Burges, 6-4; 2, Evan Chisolm, Americas, 6-4; 4, Ethan Villa, Austin, 6-2; 5, Alec Villa, Hanks, 6-0; 5, Ozzy Araiza, Ysleta, 6-0; 5, Matthew Flowers, Canutillo, 6-0; 5, Adrian Donacio, Eastlake, 6-0; 5, Dayton Jamierson, Pebble Hills, 6-0; 9, Ivann Alvarez, Americas, 5-10; 9, Sal Gandara, Mt. View, 5-10; 9, Dominic Britton, Chapin, 5-10; 9, Joshua Sanchez, Anthony, 5-10; 9, Khyrie Murdaugh, Irvin, 5-10; 9, D’Andre Ray, Eastlake, 5-10. Pole vault: 1, Keith Rodriguez, Eastlake, 14-0; 2, Daniel Cardenas, Mt. View, 12-0; 2, Matthew Sanchez, Coronado, 12-0; 4, Armando Villa, Americas, 11-6; 4, Alan Garcia, Mt. View, 11-6; 4, Angel Escalera, Parkland, 11-6; 7, Victor Saenz, Del Valle, 11-0; 7, Daniel Larios, Coronado, 11-0; 7, Austin Lara, Del Valle, 11-0; 7, Sebastian Deras, Del Valle, 11-0; 7, Andrew Almanza, Mt. View, 11-0; 7, Peter Fogel, Chapin, 11-0; 7, Luis Holguin, Burges, 11-0; 7, Evan Perez, Hanks, 11-0. Long jump: 1, Daniel Rivera, Horizon, 21-4; 1, Deion Hankins, Parkland, 21-4; 3, Hector Nevarez, Mt. View, 21-3; 4, Karch Gardiner, Del Valle, 20-11; 5, Elijah Davis, Pebble Hills, 20-8; 5, Derek Saldivar, Americas, 20-8; 5, Zacarias Velasquez, Americas, 20-8; 8, Tavorus Jones, Burges, 20-6; 9, Gilbert Rodriguez, Mt. View, 20-5.5; 10, Angel Jurado, Franklin, 20-5. Triple jump: 1, Gabriel Stonewall, Franklin 46-3; 2, Donta Hayes, Parkland, 43-1.50; 2, Julian Hinojos, Americas, 43-1.50; 4, Kamuel Sloan, Franklin, 43-1; 4, Daniel Rivera, Horizon, 43-1; 6, Takeem Thomas, Eastwood, 42-8; 7, Alec Marenco, Burges, 41-11; 8, Alec Villa, Hanks, 41-6.50; 9, Marcos Duran, Mt. View, 41-4.25; 10, Gilbert Rodriguez, Mt. View, 41-2.75. 100 meters: 1, Caleb Gerber, Pebble Hills, 10.81; 2, Omajuwa Etiwe, Franklin, 10.86; 3, Oscar Lozano, Franklin, 10.92; 4, Abel Cervantes, Americas, 10.93; 5, Fred Hernandez, Socorro, 11.03; 6, Cedric Haynes, El Dorado, 11.07; 7, Isaiah Davis, Pebble Hills, 11.19; 8, Angel Garcia, San Elizario, 11.26; 9, David Niebla, Montwood, 11.31; 10, Elias Medel, Ysleta, 11.32. 200 meters: 1, Abel Cervantes, Americas, 22.04; 2, Isaiah Davis, Pebble Hills, 22.06; 3, Omajuwa Etiwe, Franklin, 22.17; 4, Kameron Walker, Austin, 22.18; 5, Ian Tharp, Franklin, 22.49; 6, Joshua White, Burges, 22.54; 7, Caleb Gerber, Pebble Hills, 22.57; 8, Julian Hinojos, Americas, 22.65; 9, Matthew Flowers, Canutillo, 22.75; 10, Ryan Acosta, Americas, 22.86. 400 meters: 1, Omajuwa Etiwe, Franklin, 48.18; 2, Joshua White, Burges, 48.32; 3, Julian Hinojos, Americas, 49.90; 3, Michael Abeyta, Hanks, 49.90; 5, Ethan Villa, Austin, 50.24; 6, Ian Tharp, Franklin, 50.65; 7, Sam Zambrano, Burges, 51.12; 8, Abel Cervantes, Americas, 51.41; 9, Matthew Flowers, Canutillo, 51.48; 10, Michael Garcia, Eastlake, 51.68. 800 meters: 1, Liam Walsh, Coronado, 1:55.75; 2, Noah Yeager, Burges, 1:57.22; 3, Alan Alba, Coronado, 1:57.24; 4, Fernando Morales, Franklin, 1:57.44; 5, Kevin Campbell, Amerias, 1:58.39; 6, Jared Cortina, Socorro, 1:59.68; 7, Thomas Magee, Chapin, 1:59.61; 8, Edwin Gomez, San Elizario, 1:59.63; 9, Joshua Gonzalez, Mt. View, 1:59.64; 10, Matthew Lindsey, Montwood, 2:00.60. 1,600 meters: 1, Brandon Seagreaves, Cathedral, 4:18.98; 2, Michael Abeyta, Hanks, 4:23.72; 3, Tyler Rodriguez, Americas, 4:24.99; 4, Edwin Gomez, San Elizario, 4:25.63; 5, Liam Walsh, Coronado, 4:27.33; 6, Elias Perez, Eastwood, 4:27.75; 7, Rodger Rivera, Hanks, 4:29.59; 8, Nick Gonzalez, Coronado, 4:29.94; 9, Sergio Leon Cuartas, Eastwood, 4:29.98; 10, Sam Zambrano, Burges, 4:31.79. San Elizario sophomore Edwin Gomez ran a personal best 9:33.04 in the 3,200-meter run last week to break a school record he set at last year (9:38.54) at the Class 4A UIL State Championship. 3,200 meters: 1, Brandon Seagreaves, Cathedral, 9:32.02; 2, Edwin Gomez, San Elizario, 9:33.04; 3, Elias Perez, Eastwood, 9:37.52; 4, Sergio Leon Cuartas, Eastwood, 9:41.99; 5, Nick Gonzalez, Coronado, 9:50.84; 6, Michael Abeyta, Hanks, 9:45.66; 7, Rodger Rivera, Hanks, 9:47.35; 8, Kayn Quinones, Eastwood, 9:57.14; 9, Aaron Perez, Eastwood, 9:57.44; 10, Tyler Rodriguez, Americas, 9:57.55. 110 meter hurdles: 1, Infante Jones, Parkland, 14.82; 2, Dominic Britton, Chapin, 15.22; 3, Caleb Stewart, Americas, 15.40; 4, Jacob Luna, Eastwood, 15.51; 5, Gavin Hidalgo, Eastwood, 15.56; 5, Chris Martinez, Franklin, 15.56; 5, Alex Colmenero, Parkland, 15.56; 8, Joshua Massaquoi, Franklin, 15.68; 9, Donta Hayes, Parkland, 15.73; 10, Dayton Jamierson, Pebble Hills, 15.83. 300 meter hurdles: 1, Infante Jones, Parkland, 40.32; 2, Vince Armendariz, Americas, 40.77; 3, Jacob Luna, Eastwood, 41.00; 4, Chris Martinez, Franklin, 41.02; 5, Alex Colmenero, Parkland, 41.18; 6, Jonathan Plascencia, Jefferson, 41.63; 7, Gavin Hidalgo, Eastwood, 42.09; 8, Caleb Stewart, Americas, 42.19; 9, Dominic Britton, Chapin, 41.46; 10, Angel Escalera, Parkland, 42.20. 400 meter relay: 1, Americas ‘A’ (Armando Villa, Abel Cervantes, Ryan Acosta, Julian Hinojos), 43.03; 2, Pebble Hills ‘A’ (Caleb Gerber, Jim Edward, Jalen Partida, James Hadnot), 43.36; 3, El Dorado ‘A’ (Duane Nelson, Ricky Espinoza, Alex Milian, Cedric Haynes), 43.76; 4, Eastwood, 44.06; 5, Ysleta (Jalen Promesse, Elias Medel, Giovanni Martinez, Damian Carrasco), 44.13; 6, Franklin ‘A’ (Darryn Clark, Angel Jurado, Isreal Hudson, Ethan Bustillos), 44.18; 7, Austin ‘A’ (Freddy Elizondo, Andrew Yco, Kevin Usera, Kameron Walker), 44.46; 8, Burges, 44.83; 9, Montwood ‘A’ (David Niebla, Carlos Cisneros, Carlos Flores, Evan Cisneros), 44.88; 10, Horizon, 44.89. 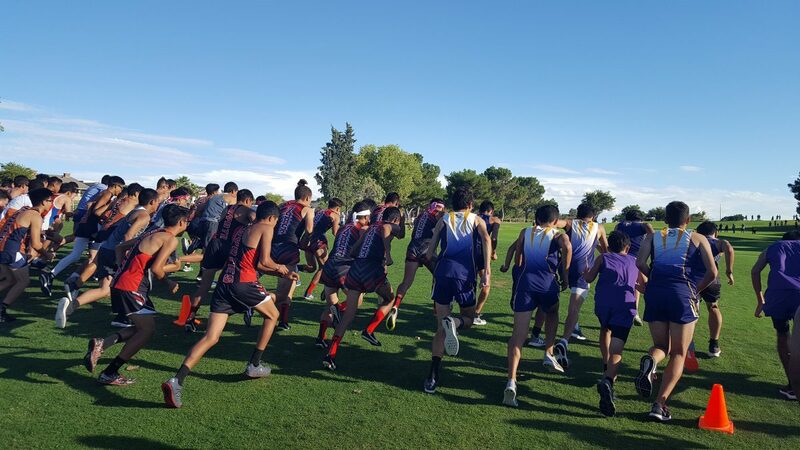 800 meter relay: 1, Americas ‘A’ (Ryan Acosta, Abel Cervantes, Julian Hinojos, Armando Villa), 1:30.07; 2, Franklin ‘A’ (Darryn Clark, Angel Jurado, Ian Tharp, Omajuwa Etiwe), 1:30.32; 3, Pebble Hills ‘A’ (Isaiah Davis, Ian Edward, Sebastian Ochoa, Galeb Gerber), 1:31.14; 4, Austin ‘A’ (Moises Morales, Kameron Walker, Miguel Vazquez, Kevin Usera), 1:31.17; 5, Eastwood ‘A’ (Marcus Ransom, Xavier Avila, Osmar Ibarra, Eddie Cruz), 1:32.85; 6, Hanks, (Samuel Guitterez, Ivan Regalado, Joey Padilla, Julian Mendoza), 1:32.91; 7, Horizon, 1:33.19; 8, El Dorado (Duane Nelson, Ricky Espinoza, Xzavion Brooks, Cedric Haynes), 1:33.23; 9, Ysleta, (Jalen Promesse, Damian Carrasco, Lucas Flores, Giovanni Martinez,), 1:33.37; 10, Burges, 1:33.49. 1,600 meter relay: 1, Franklin ‘A’ (Ian Tharp, Ethan Bustillos, Fernando Morales, Omajuwa Etiwe), 3:21.37; 2, Americas ‘A’ (Ryan Acosta, Julian Hinojos, Sir Drennan, Abel Cervantes), 3:24.33; 3, Burges, 3:24.74; 4, San Elizario ‘A’ (Alex Devora, Alexis Maldonado, Tony Diaz, Alexis Gurrola), 3:30.59; 5, Eastlake ‘A’ (Kevin Aravelo, Lorenz Smith, David Christobal, Michael Garcia), 3:30.66; 6, Austin ‘A’ (Steven Montoya, Miguel Vazquez, Andrik Zamora, Ethan Villa), 3:30.89; 7, Parkland ‘A,’ 3:32.42; 8, Coronado ‘A’ (Nick Gonzalez, Josh Espino, Alan Alba, Liam Walsh), 3:32.92; 9, Montwood ‘A’ (Brandon Williams, Kenneth Dominguez, Matthew Lindsey, Christian Rivera), 3:33.82; 10, Pebble Hills, (Caleb Gerber, Christopher Beanes, Lamont Brooks, Isaiah Davis), 3:36.18.